Nothing quite matches the aroma of foods baking with cinnamon. 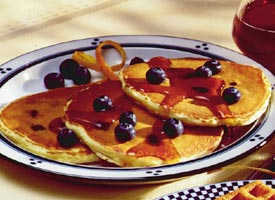 With these pancakes, that goodness can be enjoyed right away! 2. Stir Bisquick mix, milk and eggs in large bowl until blended. Stir in granola and cinnamon chips. Pour batter by slightly less than 1/4 cupfuls onto hot griddle. 3. Cook until edges are dry. Turn; cook until golden. Serve with syrup. Have a burst of blueberry and lemon flavor at breakfast, brunch or anytime you like with this moist coffee cake. 1. Heat oven to 400ºF. Grease round pan, 9x1 1/2 inches. Beat egg slightly; stir in 2 cups Bisquick mix, the sugar, milk and lemon peel. 2. Stir blueberries and 1/4 cup Bisquick mix; gently stir into batter. Spread in pan. 3. Bake 20 to 25 minutes or until golden brown. Cool 10 minutes; drizzle with Lemon Icing. Serve warm. Not just for breakfast! This flavor-packed dish is just right for any meal of the day. 1. Heat oven to 350ºF. Grease rectangular baking dish, 13x9x2 inches. Layer sausage, mushrooms, onions, tomatoes and cheese in dish. 2. Stir remaining ingredients until blended. Pour over cheese. 3. Bake uncovered 30 to 35 minutes or until golden brown and set. 1. Heat Belgian or regular waffle iron; grease with cooking spray, vegetable oil or shortening. 2. Beat eggs in small bowl on high speed about 3 minutes or until thick and lemon colored. Stir in milk. Beat in Bisquick and granulated sugar on low speed until smooth. Gently fold in oil. 3. Pour by slightly less than cupfuls onto center of hot waffle iron. Close lid of waffle iron. 4. Bake about 5 minutes or until steaming stops. Carefully remove waffle. Top with Berry Cream and additional berries. Beat whipping cream and powdered sugar in medium chilled bowl on high speed until stiff. Fold in strawberries and blueberries. Ringing the breakfast bell has never been easier! Enjoy all the traditional tastes of breakfast in one easy pie. 1. Heat oven to 400ºF. Grease rectangular baking dish, 13x9x2 inches. Cook sausage, bell pepper and onion in 10-inch skillet over medium heat, stirring occasionally, until sausage is no longer pink; drain. Stir together sausage mixture, potatoes and 1 1/2 cups of the cheese in baking dish. 2. Stir Bisquick mix, milk, pepper and eggs until blended. Pour into baking dish. 3. Bake uncovered 40 to 45 minutes or until knife inserted in center comes out clean. Sprinkle with remaining cheese. Bake 1 to 2 minutes longer or just until cheese is melted. Cool 5 minutes. A store-bought fruit pie filling is the secret to this impressive, easy-to-make pancake. 1. Heat oven to 400ºF. Generously grease rectangular baking dish or pan, 13x9x2 inches. Heat water and butter to boiling in 2-quart saucepan. Add Bisquick all at once. Stir vigorously over low heat about 1 minute or until mixture forms a ball; remove from heat. 2. Beat in eggs, two at a time, with spoon; beat until smooth and glossy after each addition. Spread in pan (do not spread up sides). Cook this hearty stew on the stove until it's ready for the biscuit that bakes in the oven. It's the easiest stew you'll ever bake! 1. Heat oven to 425ºF. Cook beef in ovenproof Dutch oven over medium heat, stirring occasionally, until brown; drain. Stir in water, tomatoes, tomato paste and vegetables. Heat to full boil, stirring occasionally; remove from heat. 2. Stir Bisquick mix and milk until soft dough forms. Drop by 6 spoonfuls onto beef mixture. Who says tacos have to be served in a taco shell? These tacos are like open-face sandwiches you eat with a fork. And you probably have all the ingredients you need on hand! 1. Heat oven to 450ºF. Grease square pan, 8x8x2 inches. Cook beef and taco seasoning mix as directed on envelope of seasoning mix. 2. Mix Bisquick mix and cold water until soft dough forms; spread in pan. Spread beef mixture over dough. 3. Bake uncovered 25 to 30 minutes or until edges are golden brown and toothpick inserted in center comes out clean. Immediately sprinkle with cheese. Let stand 1 to 2 minutes or until cheese is melted. Serve with remaining ingredients. It’s restaurant-style quiche at home! This easy ham and Swiss cheese pie is sure to be a family-pleasing entrée. 1. Heat oven to 400ºF. Grease 9-inch pie plate. Sprinkle ham, cheese and onions in pie plate. 2. Stir Bisquick mix, milk, salt, pepper and eggs until blended. Pour into pie plate. 3. Bake 35 to 40 minutes or until knife inserted in center comes out clean. Cool 5 minutes. Garnish with tomato and bell pepper. Enjoy homemade chicken pot pie taste made extra easy. Use whatever ingredients you have on hand! 1. Heat oven to 400ºF. Stir vegetables, chicken and soup in ungreased 9-inch pie plate. 2. Stir remaining ingredients until blended. Pour into pie plate. 3. Bake about 30 minutes or until golden brown. Cheddar cheese and Bisquick® mix join forces in this hearty meal of ground beef and mixed veggies. 1. Heat oven to 400ºF. Generously grease rectangular baking dish, 13x9x2 inches. Cook ground beef and onion in 10-inch skillet over medium heat, stirring occasionally, until beef is brown; drain. Stir in soup, vegetables and milk. 2. Stir Bisquick mix and water in baking dish until moistened; spread evenly. Spread beef mixture over batter. Sprinkle with cheese. This is our all-time favorite recipe for pancakes! It’s simple and tastes so good. 2. Stir all ingredients until blended. Pour by slightly less than 1/4 cupfuls onto hot griddle. 3. Cook until edges are dry. Turn; cook until golden. Note: If you like thin pancakes, use 1 1/2 cups milk. can you picture butter melting on waffles right out of the waffle iron and rich syrup filling those tiny little squares? Yum! 1. Heat waffle iron; grease with vegetable oil or shortening. 2. Stir ingredients until blended. Pour onto center of hot waffle iron. Close lid of waffle iron. 3. Bake about 5 minutes or until steaming stops. Carefully remove waffle. Biscuits aren’t just for breakfast anymore. The sweet cinnamon and raisin taste of these quick drop biscuits makes them a great snack with a cup of hot cocoa! 2. Stir all ingredients in medium bowl until soft dough forms. Drop by 9 spoonfuls onto ungreased cookie sheet. Sprinkle with additional sugar, if desired. 3. Bake 10 to 12 minutes or until golden brown. Bisquick Heart Smart™ recipe! Welcome family to a complete and tasty baked dinner in a dish. 1. Heat oven to 350°F. In small bowl, mix brown sugar, margarine and cinnamon until crumbly; set aside. Slice squash into 1/2-inch rings. Cut rings in half; remove seeds. Cut apple into chunks. 2. In shallow dish, stir together Bisquick® mix, seasoned salt, pepper and cracker crumbs. In another shallow dish, mix egg and water. Dip pork into egg mixture, then coat with Bisquick mixture. 3. Spray 12-inch nonstick skillet with cooking spray; heat over medium-high heat. Cook pork in skillet 6 to 8 minutes, turning once, until coating is brown. 4. Place pork in ungreased 13x9-inch (3-quart) glass baking dish. Arrange squash and apples around pork. Sprinkle with brown sugar mixture. Bake uncovered 40 to 45 minutes or until squash is tender and pork is no longer pink in center. Why deep-fry? Bake juicy, tender chicken with a tasty seasoned coating. It’s the start of a great meal. 1. Heat oven to 425ºF. Melt butter in rectangular baking dish, 13x9x2 inches, in oven. 2. Stir together Bisquick, paprika, salt and pepper; coat chicken. Place skin sides down in dish (dish and butter should be hot). Plump biscuits cook on top of hearty hamburger stew. It’s comfort food for a weeknight supper! 1. Cook beef in 4-quart Dutch oven over medium heat 8 to 10 minutes, stirring occasionally, until brown; drain. 2. Stir water, 1 teaspoon oregano, 1/2 teaspoon basil, the garlic, celery, onion, beans, broth and tomatoes into beef, breaking up tomatoes. Heat to boiling; reduce heat. 3. Stir remaining ingredients until soft dough forms. Drop dough by 12 spoonfuls onto beef mixture (do not drop directly into liquid). Cook uncovered over low heat 10 minutes. Cover and cook 10 minutes longer. Wake up dinner with crispy-coated baked chicken covered in a refreshing lemon and apricot sauce. 1. Heat oven to 425ºF. Spray jelly roll pan, 15 1/2x1 inch, with cooking spray. Beat egg product and water slightly. Mix Biquick, lemon peel and garlic powder. Flatten chicken breast halves between sheets of plastic wrap or waxed paper to 1/2-inch thickness. 2. Dip chicken into egg mixture, then coat with Bisquick mixture. Place in pan. Spray chicken with cooking spray. 3. Bake uncovered 20 minutes. Turn; bake 10 minutes longer or until juice is no longer pink when centers of thickest pieces are cut. Make Lemon-Apricot Sauce. Cut chicken crosswise into 1/2-inch slices. Pour sauce over chicken. Garnish with lemon slices. Nothing warms you like hearty chicken pot pie. This one’s loaded with vegetables and has a tender, flaky crust made with Bisquick® mix. 1. Heat oven to 400ºF. Mix vegetables, chicken and soup in ungreased 2-quart casserole. 2. Stir remaining ingredients in small bowl with fork until blended. Pour into casserole. 3. Bake 30 minutes or until golden brown. 1. Cook beef and onion in Dutch oven over medium heat, stirring occasionally, until beef is brown; drain. Reserve 1/2 cup of the corn. Stir remaining corn with liquid, tomatoes, tomato sauce, chili powder and pepper sauce into beef mixture. Heat to boiling; reduce heat. Cover and simmer 15 minutes. 2. Mix Bisquick mix and cornmeal. Stir in milk, cilantro and reserved 1/2 cup corn just until moistened. 3. Drop dough by rounded tablespoonfuls onto simmering chili. Cook uncovered over low heat 10 minutes. Cover and cook 10 minutes longer or until dumplings are dry. Satisfy your love of comfort food in record time! Make tasty dumplings over loads of creamy chicken and vegetables in just 30 minutes. Make their morning with light, tender pancakes. Your fresh or frozen blueberries make them extra-special. 2. Stir Bisquick, milk and eggs until blended; gently stir in blueberries. Pour by slightly less than 1/4 cupfuls onto hot griddle. Panfry spicy chicken with a crunchy coating that’s perfect on a plate with vegetables or on a bun as a sandwich. 1. Flatten each chicken breast half to 1/4-inch thickness between sheets of waxed paper or plastic wrap. 2. Crush cereal. Mix cereal, Bisquick and Cajun seasoning. Dip chicken into water, then coat with cereal mixture. 3. Melt butter in 12-inch nonstick skillet over medium heat. Cook chicken in butter 8 to 10 minutes, turning once, until juice is no longer pink when centers of thickest pieces are cut. Create fun and tasty mini-pizzas by topping pancakes with all of your favorite toppings. Who would have thought that "pizza" was so easy to make? 1. Heat griddle or skillet; grease if necessary. Stir Bisquick, milk and eggs in large bowl until blended. Stir in remaining ingredients except pizza sauce and Parmesan cheese (batter will be thick). 2. Pour batter by slightly less than 1/4 cupfuls onto hot griddle; spread slightly.3. Cook until edges are dry. Turn; cook until golden brown. Serve topped with pizza sauce. Sprinkle with Parmesan cheese. It's a quick, tasty bite! Whip up a batch of crispy-coated chicken chunks in your microwave. They're perfect for dipping. 1. Mix all ingredients except chicken and oil in 2-quart resealable plastic bag. Mix chicken and oil. 2. Shake about 6 chicken pieces at a time in bag until coated. Shake off any extra crumbs. Place chicken pieces in single layer on microwavable rack in microwavable dish. 3. Cover with waxed paper. Microwave on High 3 minutes. Turn dish 1/2 turn. Microwave 4 to 5 minutes longer or until chicken is no longer pink in center. Cross the border to a new waffle! Topped with tostado fixin’s, these waffles can be served morning, noon or night. 1. Heat waffle iron; grease with shortening if necessary (or spray with cooking spray before heating). Stir Bisquick, milk, oil and egg in large bowl until blended. Stir in chilies and chili powder. 2. Pour about 1/2 cup batter onto center of hot waffle iron. (Waffle irons vary in size; check manufacturer’s directions for recommended amount of batter.) Close lid of waffle iron. Bake about 5 minutes until steaming stops and waffle is golden brown. Carefully remove waffle. Repeat with remaining batter. 3. While waffles are baking, cook beef as directed on package of seasoning mix. Top waffles with beef and remaining ingredients. Have a cool, fresh slice. This fun appetizer pizza has a cream cheese-tuna sauce and is topped with loads of fresh vegetables. 1. Heat oven to 450ºF. Stir Bisquick, boiling water and onions in medium bowl until soft dough forms; beat vigorously 20 strokes. 2. Pat dough with floured hands in ungreased 12-inch pizza pan, forming 1/2-inch rim. 3. Bake about 10 minutes or until light brown. Cool 10 minutes. Dinner is easy to make when you bake turkey on a tender crust in its own homemade barbecue sauce. 1. Heat oven to 375ºF. Stir together turkey, chili sauce, honey, soy sauce, pepper sauce and onion; set aside. 2. Stir Bisquick mix and cold water until dough forms; beat 20 strokes. Pat dough into rectangle, 12x6 inches, on ungreased cookie sheet with hands dusted with Bisquick mix; pinch edge, forming 1/2-inch rim. Spoon turkey mixture onto dough. When your family is hankering for meat and potatoes, put together this easy casserole. 1. Heat oven to 400ºF. Cook beef, onion, mushrooms and salt in 12-inch skillet over medium heat, stirring occasionally, until beef is brown. 2. While beef is cooking, heat water and butter to boiling in 2-quart saucepan; remove from heat. Stir in potatoes (dry) and sour cream. Let stand 1 minute, then stir vigorously until smooth. Stir in 2/3 cup Bisquick mix, the chives and egg. 3. Drain beef mixture. Stir 3 tablespoons Bisquick mix into soup. Stir soup mixture, broccoli and ketchup into beef mixture. Heat to boiling. Boil uncovered 1 minute. Pour into ungreased 3-quart casserole. Scoop potato dumpling mixture around edge of casserole. 4. Bake uncovered 25 to 30 minutes or until dumplings are light golden brown. This marvelous turkey torta has a very familiar taste that will remind you of both delicious deep-dish pizza and quiche. 1. Heat oven to 375°F. Mix Bisquick mix, dressing and beans. Spread in bottom and 2 inches up side of springform pan, 9x3 inches. Bake 10 to 12 minutes or until set. 2. Layer with turkey, spinach and cheese. Mix eggs and milk; pour over cheese. Sprinkle evenly with almonds. 3. Bake 50 to 55 minutes or until golden brown and knife inserted near center comes out clean. Let stand 10 minutes. Loosen edge of torta from side of pan; remove side of pan. Family tired of pumpkin pie? Let them eat cake this time! 1. Heat oven to 350ºF. Grease and flour 12- cup bundt cake pan. 2. Beat Bisquick, granulated sugar, brown sugar, butter, pumpkin pie spice, 1/4 cup milk, eggs and pumpkin in large bowl on low speed 30 seconds. Beat on medium speed 3 minutes. Spread in pan. 3. Bake about 50 minutes or until toothpick inserted in center comes out clean. Cool 10 minutes; turn upside down onto heatproof plate or wire cooling rack. Remove pan; cool cake completely. 4. Stir remaining ingredients until smooth and thin enough to drizzle. Drizzle over cake. Surprise family and friends and bake this cake in a bundt pan with a newer shape. Sliced apples bake into the top of this rich, tempting cake. It's easy and fun because the caramel sauce forms while it bakes. 1. Heat oven to 350ºF. Mix Bisquick and granulated sugar in medium bowl. Stir in milk until blended. 2. Pour into ungreased square pan, 9x9x2 inches. Top with apples; sprinkle with lemon juice. Mix brown sugar and cinnamon; sprinkle over apples. Pour boiling water over apples. 3. Bake 50 to 60 minutes or until toothpick inserted in center comes out clean. Serve warm with whipped cream. Dessert doesn't get any better than a favorite fruit combo transformed into an easy, warm-from-the-oven cobbler! 1. Heat oven to 375º. Lightly butter bottom and side of deep-dish pie plate, 9x1 1/2 inches. 2. Mix peaches, raspberries, granulated sugar, cornstarch and nutmeg in large bowl. Let stand 10 minutes. Spoon into pie plate. 3. Stir together remaining ingredients in same bowl until dough forms. Drop dough by spoonfuls onto fruit mixture. Bake 25 to 30 minutes or until fruit is bubbly and topping is deep golden brown and thoroughly baked. 2. Stir Bisquick mix, milk, sugar and butter until soft dough forms. Drop by 6 spoonfuls onto ungreased cookie sheet. 2. Place milk, vanilla, eggs, sugar and the Bisquick mix in blender. Cover and blend on high speed 15 seconds. Add cream cheese. Blend 2 minutes longer. Pour into pie plate. 3. Bake 40 to 45 minutes or until knife inserted in center comes out clean; cool. Refrigerate until ready to serve. Cover and refrigerate any remaining cheesecake. Topping: If desired, make topping and spread over top of completely cooled cheesecake. Stir together 1 cup sour cream, 2 tablespoons sugar and 2 teaspoons vanilla. Serve with fruit. Surprise your sweetie pie with a giant cherry cookie tart. They'll love the thought and the rich chocolate-cherry taste. 1. Heat oven to 400ºF. Stir together powdered sugar, cream cheese, almond extract and egg. Stir in Bisquick mix. Pat dough into 12-inch circle on ungreased cookie sheet. 2. Bake 8 to 10 minutes or until light golden brown. Sprinkle chocolate chips over hot crust. Bake 1 minute longer or until chips are melted; spread evenly. Cool 5 minutes. Gently loosen and transfer to serving plate. 3. Spread pie filling over crust. Heat white baking chips and shortening over low heat until smooth; drizzle over pie filling. pound for pound, this is one of the moistest Bisquick® mix pound cakes ever! 1. Heat oven to 350°F. Grease and flour angel food cake pan (tube pan), 10x4 inches, 12- cup bundt cake pan or 2 loaf pans, 9x5x3 inches. 2. Beat all ingredients except powdered sugar in large bowl on low speed 30 seconds, scraping bowl frequently. Beat on medium speed 4 minutes, scraping bowl occasionally. Pour into pan. 3. Bake 55 to 60 minutes or until toothpick inserted near center comes out clean. Cool 5 minutes; turn pan upside down onto wire rack or heatproof serving plate. Remove pan; cool cake completely. Sprinkle with powdered sugar. 1. Heat oven to 350ºF. Lightly grease bottom and sides of jelly roll pan, 15 1/2x10 1/2x2x1 inch. 3. Bake 20 to 25 minutes or until brown. Immediately remove from pan. Serve warm with sauce for dipping. Make this appetizer favorite at home! The crispy, golden brown outside holds rich, gooey melted cheese. 1. Place cheese sticks on tray; freeze at least 1 hour. 2. Heat 2 inches of oil to 375ºF in large heavy saucapan or follow manufacturer's direction on deep fryer. Beat Bisquick mix, paprika, milk and egg until smooth. Dip cheese, 1 stick at a time, into batter, covering cheese completely. 3. Fry 8 to 10 sticks at a time 1 to 2 minutes, turning carefully, until golden brown. Drain on paper towels. Let stand 3 minutes before serving. Serve with marinara sauce. For those who love all the heat and fire that a chicken wing can deliver, we offer you this recipe. Hot sauce heat levels vary considerably, so choose wisely! 1. Stir together hot sauce and garlic salt until blended. Pour over drummettes; cover and refrigerate at least 4 hours but no longer than 24 hours. 2. Heat oven to 450ºF. Melt butter in jelly roll pan, 15 1/2x10 1/2x1 inch, in oven. Stir together Bisquick mix, onion salt and peppers. Remove chicken from sauce; discard sauce. Coat chicken with Bisquick mixture. Place in single layer in pan. 3. Bake 25 minutes; turn and bake an additional 20 to 25 minutes or until chicken is golden brown and juice is no longer pink when centers of pieces are cut. Serve with dressing. Go bananas! Nothing beats the taste or aroma of baked banana bread. It's just like mom's but much, much easier. 1. Heat oven to 350ºF. Grease bottom of 9x5x3-inch loaf pan. 2. Stir bananas, sugar, milk, oil, vanilla and eggs in large bowl. Stir in Bisquick mix and nuts. Pour into pan. 3. Bake 50 to 60 minutes or until toothpick inserted in center comes out clean; cool 10 minutes. Loosen sides of loaf from pan; remove from pan and place top side up on wire rack. Cool completely, about 2 hours, before slicing. Wrap tightly and store at room temperature up to 4 days, or refrigerate up to 10 day. You like breadsticks at restaurants, why not make them at home? They're easy to make and have a spicy pepperoni taste perfect for dipping. 1. Heat oven to 425ºF. Mix Bisquick, cold water and pepperoni until dough forms; beat 20 strokes. Turn dough onto surface dusted with Bisquick; gently roll in Bisquick to coat. Knead 5 times. 2. Roll dough into 10-inch square. Cut in half. Cut each half crosswise into 14 strips. Twist ends of strips in opposite directions. Place on ungreased cookie sheet, pressing ends onto cookie sheet to fasten securely. Brush generously with butter. Sprinkle with cheese. 3. Bake 10 to 12 minutes or until light golden brown. Heat pizza sauce until hot. Serve breadsticks warm with sauce for dipping. Make this easy and colorful dough for hours of playtime fun. Kids love it! 1. Stir Bisquick, salt and cream of tartar in 4- cup microwavable measuring cup until mixed; set aside. Mix water and food color in liquid measuring cup. 2. Stir a small amount of colored water at a time into dry mixture until all water is added. Microwave uncovered on High 1 minute. Scrape mixture from side of cup and stir. 3. Microwave uncovered 2 to 3 minutes longer, stirring every minute, until mixture almost forms a ball. Let dough stand uncovered about 3 minutes. 4. Remove dough from measuring cup, using spoon. Knead dough in your hands or on the counter about 1 minute or until smooth. (If dough is sticky, add 1 to 2 tablespoons Bisquick.) Cool about 15 minutes. Use dough to make shapes and designs. Store in tightly covered container in refrigerator. Make everyone smile with a cookie tart to call their own! Decorate each frosted tart with each person's favorite fresh fruit. 1. Heat oven to 375ºF. Stir Bisquick, 2/3 cup sugar, the butter and eggs in large bowl until soft dough forms. Pat dough into sixteen 3-inch circles on ungreased cookie sheets. 2. Bake 8 to 10 minutes or until edges just begin to brown. Remove from cookie sheet to wire rack. Cool completely, about 30 minutes. 3. Beat cream cheese, 1/3 cup sugar and the vanilla in small bowl with electric mixer on low speed until smooth. Beat in whipping cream on high speed until stiff peaks form. Spread over tarts to within 1/4 inch of edges. Place fruit on top; brush with jelly. Store covered in refrigerator. What fun! Hot dogs are baked in their own buns! This is a favorite for kids of all ages. 1. Heat oven to 425ºF. Grease cookie sheet. Mix Bisquick, milk and mustard until soft dough forms; beat 30 seconds. Turn dough onto surface dusted with Bisquick; roll in Bisquick to coat. Shape into ball; knead 10 times. 2. Roll dough into 13-inch circle; cut into 8 wedges. Place about 1 teaspoon pickle relish and 1 cheese strip on each wedge about 1 inch from rounded edge. Top with hot dog. Roll up, beginning at rounded edge. Place crescents, with tips underneath, on cookie sheet. 3. Bake about 12 minutes or until golden brown. Serve with additional pickle relish. 1. Heat oven to 450ºF. Grease 12-inch pizza pan. Stir together Bisquick mix and very hot water; beat 20 strokes until soft dough forms. 2. Press dough in pizza pan. Spread pizza sauce over dough. Top with remaining ingredients. 3. Bake 12 to 15 minutes or until crust is golden brown and cheese is bubbly. One plus one equals delicious! Chocolate and peanut butter are a perfect match in these classic cookies. 1. Heat oven to 375ºF. Mix milk and peanut butter in large bowl until smooth. Stir in Bisquick and vanilla. 2. Shape dough into 1 1/4-inch balls. Roll in sugar. Place 2 inches apart on ungreased cookie sheet. 3. Bake 8 to 10 minutes or until bottoms of cookies just begin to brown. Immediately press 1 chocolate candy into top of each cookie. Bisquick Heart Smart™ recipe! Have a fiesta with a chicken breast main meal that's in the oven in minutes! 1. Heat oven to 400°F. Spray 8- or 9-inch square pan with cooking spray. In small bowl, stir together Bisquick® mix, water and egg product; spread in pan. Sprinkle with 1 1/4 cups of the cheese. 2. In 10-inch nonstick skillet, cook chicken over medium-high heat, stirring frequently, until outsides turn white; drain. Stir in salsa; heat until hot. Spoon over batter in pan to within 1/2 inch of edges. Use 6 cups precooked chicken, and heat with the salsa. Three chicken breasts weigh about one pound. Serve with bowls of shredded lettuce, chopped tomatoes and fat-free sour cream. Bisquick Heart Smart™ recipe! Discover a tasty way to sneak v eggies into a main-dish bake. It’s okay to invite the neighbors because it serves eight! 1. Heat oven to 400°F. Spray 13x9-inch pan with cooking spray. In medium bowl, stir together Bisquick® mix, water, egg product and 1 cup of the cheese; spread in pan. 2. In 10-inch skillet, cook beef over medium-high heat 5 to 7 minutes, stirring occasionally, until brown; drain. Stir in soup and vegetables; heat until hot. Spread over batter in pan. Use ground turkey breast for the extra-lean ground beef. Use Green Giant® frozen broccoli cuts for the mixed vegetables. California-style, with lettuce and tomato. The classic thin pancake is made extra-easy with Bisquick® mix. The veggie filling and cheese make these crepes perfect fare for breakfast, lunch or dinner. 1. Lightly grease 6- or 7-inch skillet; heat over medium-high heat. Stir Bisquick mix, milk and eggs in medium bowl with wire whisk or fork until blended. 2. For each crepe, pour 2 tablespoons batter into hot skillet; rotate skillet until batter covers bottom. Cook until golden brown. Gently loosen edge with metal spatula; turn and cook other side until golden brown. Stack crepes, placing waxed paper between, as you remove them from skillet. Keep crepes covered to prevent them from drying out. 3. Heat oven to 350°F. Make Vegetable Filling. Spoon filling onto crepes. Sprinkle half of the cheese over filling on crepes; roll up crepes. Place seam sides down in ungreased rectangular baking dish, 11x7x1 1/2 inches. Sprinkle with remaining cheese. Bake uncovered 10 to 12 minutes or until hot. Crepes can be frozen up to 3 months. Stack cool unfilled crepes with waxed paper between. Wrap in aluminum foil, or place in airtight plastic bag; label and freeze. Thaw at room temperature about 1 hour or in refrigerator 6 to 8 hours. Veggies left from last night’s dinner? Add them to the filling. A corn batter tops chicken and favorite Mexican ingredients and turns into one hot tamale--pie, that is! 1. Heat oven to 400°F. In 9-inch glass pie plate, stir chicken, chiles and taco seasoning until mixed. Sprinkle with cheese. 2. In medium bowl, stir Bisquick mix, cornmeal, milk, egg and corn until blended. Pour over chicken mixture and cheese. 3. Bake 25 to 30 minutes or until toothpick inserted in topping comes out clean. To serve, cut into wedges and top with lettuce, sour cream and salsa. Mash an avocado and stir into 1 cup of your favorite salsa. Spoon on top of shredded lettuce for a quick side salad. For Beef Tamale Pie, use 1 pound of ground beef in place of the chicken. Cook the beef over medium heat 8 to 10 minutes, stirring occasionally, until brown; drain. Like things spicy? Seed and chop 1 canned chipotle chile, and add to the chicken mixture.